In 1987 I graduated at Leiden University on the field of Solid State Chemistry working on crystal structures of perovskites. 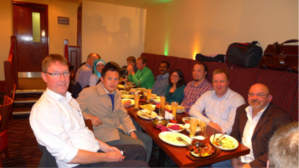 Hereafter I worked two years as AIO2 also in Leiden. I did my PhD in 1990 in the field of ceramic superconductors. I joined Philips Research in 1987 where I worked in Eindhoven on inorganic materials for electronic applications and later in Philips Forschung Aachen (Germany) on electronic ceramics, including piezoelectric ceramics. When Philips stopped its activities in the field of passive components I joined Morgan Electroceramics as R&D manager in 2002 where I was responsible for projects with customers to implement piezo-technology into their products. Furthermore, I led a project on a new production line for the making of multilayer piezoelectric actuators. 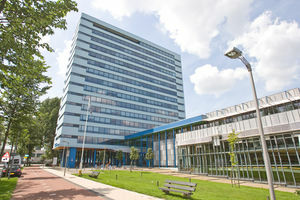 From January 2008 until September 2011, I was department head of the group Materials Performance at TNO Science and Industry. Since 2011 I am working at the Holst Centre as programme manager for the programs “Large Area Printing” and “Printed Conductive Structures”. In 2009, I joined the Novel Aerospace Materials (NovAM) group as a visiting scientist starting new activities in the field of Smart Materials & Sensors. 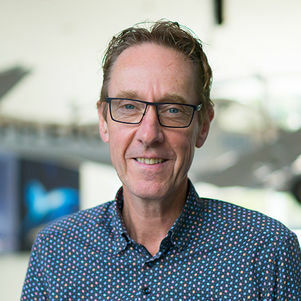 Since 2012 I am a part time full Professor at the faculty of Aerospace Engineering on the chair “SMART Materials” next to my work at the Holst Centre. Piezoelectric sensors offer tremendous benefits for many sensing applications, by being able to convert mechanical energy to electrical energy. Applications range from pressure switches to damage detection systems. In addition piezoelectric materials are well suited as electrical energy generators (power harvesting systems). State-of-the-art piezoelectric materials such as PZT ceramics and PVDF polymers possesses several drawbacks in other areas, which limits their use as successful sensor and energy scavenger materials. Piezoelectric composites have the potential of overcoming many of these drawbacks, but generally suffer from compromised piezoelectric properties, ultimately lowering the output signal. Novel concepts are being explored to exploit the composites advantages, while employing novel techniques to increase piezoelectric signal output from these materials to a higher level. An important topic in the aviation industry is Structural Health Monitoring. Currently, the safety of airplanes is secured by inspections at regular intervals which are optical or by ultrasound. In the ideal case, sensors for SHM will be built into the airframe and connected to a network. In case of difficult to reach places wireless sensors will be incorporated in the structural system. However, the lifetime of such systems is limited by the lifetime of the batteries which are used to power these systems. Solution for this can be found by energy scavenging or harvesting systems. Part of these systems are also based on piezoelectric materials by the application is still very limited. Both energy harvesting systems and sensors for SHM will be part of the new research. Visiting Ian Reaney’s group in 2012. 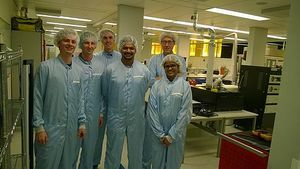 Visiting the Holst Centre in 2014, with NovAM master's students, as part of the course on: Sensor materials (AE4ASM104). 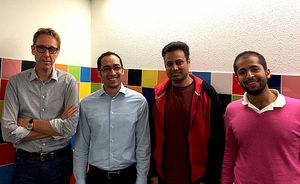 Visit of Ibrahim Khaled and Alfonso Caraveo van Sabic CRI in 2015. February 2013 marked the start of Light.Touch.Matters, in which designers and material researchers joined forces to develop a fully-new generation of smart materials that can sense touch and respond with luminescence. The base technologies are novel piezo plastics and flexible OLEDs. Being thin, flexible and formable, these light touch materials promise to revolutionize product interface design by integrating luminescence and touch in such a way that eventually the product becomes the interface. During the project, various technology demonstrators were developed to demonstrate the potential of such novel interface technologies, principally within the domain of care, although opportunities for spin-off to other domains (e.g. automotive) were also be addressed. Light.Touch.Matters was a unique cooperation between product designers and material scientists, with 17 partners from 9 EU countries. It was funded through a grant in the European Commission’s 7th Framework Programme and ran for 3.5 years until July 2016.